Chanel’s Fall 2011 nail lacquers are already available on Chanel.com. The collection is a moody trio of heavy metallic polishes, each with its own finish. I’ve grouped all of my pictures of the collection into one post so it’s a long one! Chanel polishes come in square bottle with a big square cap that pops off to reveal a small, nubby brush cap that makes application easier. The brush is a thin brush like the Essie brush, rather than a wide one like Dior or OPI. All three of these polishes took me three coats for full opacity. I tend to apply thin coats, especially with metallic finishes, since thin coats can dry down better and not look as brushstroke-y. I’ll start with the polish that I was least excited about–Quartz is a warm, tannish color with silver shimmer/sparkle. The shimmer is heavy and could almost be frosty, but with three thin coats the brushstrokes weren’t too noticeable for me. You have to pay attention to application with this one since it’s a straight shimmer and could leave brushtrokes if you’re not careful, but the polish is thin but not runny and wasn’t too difficult to work with. I liked this one a lot better than I thought I would-on the nail, the heavy shimmer comes alive and gives a glinty, changeable look. Sometimes it’s very silvery and grey, and then in different lighting it has more of a warm, beige look. It’s a quiet polish but still pretty and textured. 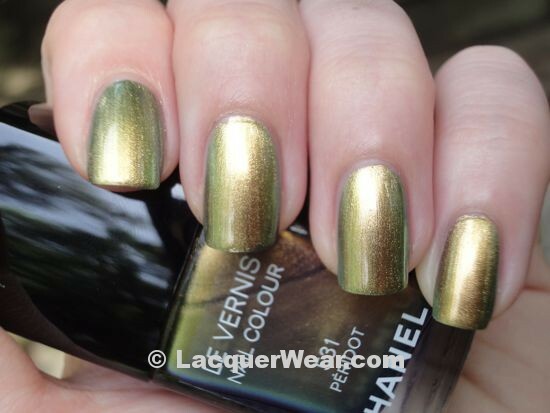 This is the one polish out of the trio that seems to be part of Chanel’s permanent line up–on Chanel.com it gives you the option to do automatic refills of this color, but the other two are marked “Limited Edition” and don’t give that option. So this polish should be available for a bit longer than the other two. Next is Graphite-this appeared in Chanel’s Fall 2011 runway show back in March, and there has been a lot of interest in this color. It’s a silvery-grey foil, but it has a lot of gold pieces as well, so it has a warmer and lighter look than a lot of silver foils. In the sunlight I almost thought I saw little blue foil pieces flashing among the silver and gold as well-it’s very lively and flashy. I really like this one, too, and it just seems somehow nicer and more complex than other similar colors. It’s not too dark or grey, and is just so sparkly! I pulled out my Dior Rock Coat for this one–Rock Coat doesn’t do so well over lighter colors so I haven’t been using it too much over the summer polishes I’ve been wearing. I’m kind of excited to try it over the new, darker fall colors that we’ll be seeing soon, and Graphite seemed a perfect place to start. Rock Coat turns it darker in a glossy, warm way that maintains Graphite’s golden, flashy sparkle. It’s fun because it still looks different than say, China Glaze Jitterbug. Finally my favorite from the collection-Peridot is a golden shimmer with a green duochrome flash. It’s in between Quartz and Graphite in terms of finish-there’s a bit of bigger sparkle than in Quartz, so it’s slightly less frosty. I love how this polish shows tones ranging from amber-orange to green; it’s a rich, heavy polish that will look perfect come fall. I thought the duochrome effect was quite noticeable, so although a warm gold is the overall look you get, there’s a green flash around the edges in most light. So pretty! 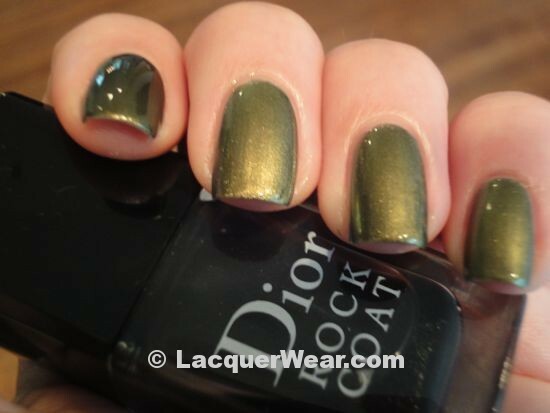 Finally, a coat of Rock Coat dulled the duochrome flashiness of Peridot, but also pulled the color more green and grey. It’s a more toned down look. It’s kind of fun but I think I like Rock Coat over Graphite better. These three polishes are available on Chanel.com now, and as noted Graphite and Peridot say that they’re limited editions. Yes! I like how heavy and autumnal they are. Not sure if you’re trying to say you (and by reflection me) are vapid or vain, but I’m a nail polish connoisseur with no apologies.